“SO WHICH is harder, building a house or writing a novel?” I ask novelist Thomas King and his partner, Helen Hoy, who is a painter. I’m sitting with them on a Sunday morning in their expansive, modern Water Street house, which they constructed eight years ago as they were both approaching retirement from English professorships at the University of Guelph. King has just made me an excellent cortado with his home espresso machine — clearly, coffee is a passion of his, as he times the double shot of coffee at exactly 45 seconds — while Hoy ushers overnight guests out to their car. “At least with a house, you have a blueprint,” says King. It’s a comfort he doesn’t enjoy when writing novels, where his methodology is to start slowly with a first chapter, sometimes taking years and dozens of drafts until the story’s direction is clear. “However, with writing, I can always throw away a chapter if I don’t like it,” he adds, smiling. There’s no such luxury with house building. Design and material decisions — even outright mistakes — become irreversible in very short order. “With writing, you can only see as far ahead as your headlights,” says Hoy, paraphrasing American writer E.L. Doctorow, “but you can also make the whole journey that way.” Not so with a house. The big decisions must be planned and budgeted from the outset, even if you make small turns and detours along the way. She also compares house design to storytelling. “Building a house has to do with dreaming, just like conceiving a novel,” she says. She recalls that King was sketching house designs years, even decades, before he got the chance to actually build one. There’s one more similarity between the two types of projects: “When you build your own home, you must choose absolutely everything,” says King, and the selection is sometimes bewildering, like writing a story, with a myriad of plot and character possibilities in front of you. Nonetheless, after they emerged from the chaos of construction in 2007, they had a place that would house King as he wrote his two recent, bestselling books: “The Inconvenient Indian: A Curious Account of Native People in North America,” which won two major non-fiction awards in early 2014, and “The Back of the Turtle,” which won the Governor-General’s Literary Award for Fiction last November. And the new space helped Hoy to establish her post-retirement career as a landscape painter. The two things even came together with “The Back of the Turtle,” as a Hoy painting graces the cover of King’s novel. Their spacious house blends in with the lines and colours of their Old University neighbourhood, but its architectural style is unique. You can’t miss their home if you drive west along Water Street toward McCrae House. Their house sits at the corner of Mary Street, a low building with huge overhanging eaves and picture windows facing the intersection. From inside, the main floor is barely a step above grade, and you gaze out at a visual splendour. Their river view to the north is like a painting, with a low, perennial garden in the foreground — a row of yews bordering the property instead of a fence — the south bank of Royal City Park in the middle-ground and the Speed River framed by several dozen towering silver maples in the background. The house was designed by Guelph architect J. David McAuley. Its low angles and broad expanse almost conceal the fact it is two storeys high, which is confirmed by a second-floor gable facing the river. To my eye, it also references 20th-century American architect Frank Lloyd Wright, with its prairie lines, natural materials (wood and limestone), large overhangs and concealed front door (the main entrance is off Mary Street). Curiously, their retirement home almost didn’t happen, the project nearly faltering at the point of conception. King and Hoy had been looking for a property for years, wanting to downsize from their large home on Ardmay Crescent, an exclusive street near St. George’s Park. After looking as far afield as Elora and Eden Mills, their real estate agent tipped them off about an attractive Water Street property with a small, wood-frame house that was about to come on the market. They were drawn to the location next to the river and by the 66-by-99-foot lot. They offered to purchase the property in 2006 for just over $200,000 and won an ensuing bidding war, always assuming they would be able to tear down the existing house and start from scratch. However, those plans were nearly thwarted. The first hurdle was the historical society, which wanted to be sure they weren’t tearing down a significant early Guelph structure. It had been owned by Jehu Clarke in the 19th century, the man who designed the original bridge across the Speed River at Gordon Street. However, King and Hoy were able to prove to the society that it was never lived in by Clarke. And they demonstrated that the building was unsound, as it lacked a proper foundation and was uninsulated. They didn’t seriously consider renovating the old house, to enlarge or upgrade it. They had experience renovating old buildings before and “you keep falling down rabbit holes,” Hoy says. Next, they approached McAuley for a design, attracted by his reputation for building with energy efficiency and environmental awareness as guiding principles. He asked them for a list of what they wanted to do in the house — how they would live on a daily basis. He took their wish lists — a large kitchen, an open-concept communal living space, separate offices for the two of them and a north-facing painting studio for Hoy — and gave them a design. She also saw the project as a way to “put a tether on his ankle,” she says with an affectionate nod to King. He’d never lived in one place for more than a decade, and longed to return to Western Canada, where they met 35 years ago. “If she dies, I’m gone,” he says, “out to Vancouver Island.” I don’t think he’s joking. In the end, they went back to McAuley and modified their wish list of features. Gone were the plans for geothermal heat (impractical on the rocky city lot), a greywater recycling system, solar power and a central stone fireplace and chimney. They also compromised on a heavy structure that would support their tons of books on the second floor of the house. But they kept some key environmental features of McAuley’s original plan. The King and Hoy house is built, very unusually, out of concrete-filled Durisol block. It’s a type of insulated concrete form made out of recycled material — mostly wood waste. The house has no basement, so the forms were used for the main-floor walls. In addition, the walls are built to “breathe” — allowing gases and moisture to pass through — so the home is built without a vapour barrier, much to the consternation of the city building inspectors, who insisted the couple install a heat-exchange system that would bring fresh air into the house and vent the interior air, not trusting the ventilation claims of the Durisol system. The space heating is a radiant, under-floor system with hot water supplied by a natural gas boiler. Armed with a new plan that fit their budget, the couple decided to “take the plunge.” And so demolition of the old house and construction of the new one began. The tearing down took a week, a process Hoy describes as “exciting.” They worked with their contractor, disassembling by hand so they could save any usable wood and stone from the old house to incorporate into the new one. 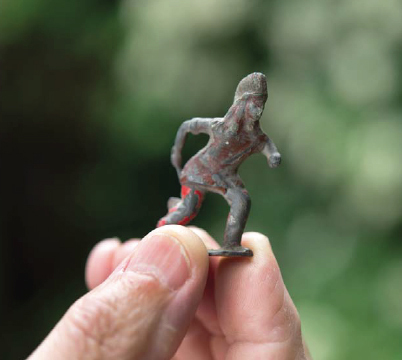 As they poked around the sandy topsoil that barely overlies the limestone bedrock below their building site, King came upon an interesting find: a small, iron Indian figurine. It was surely an ironic moment: a guy who makes his living chronicling the cultural genocide of native peoples coming across a toy Indian in the soil he intends to build his dream house on. Several years later, he would write in “The Inconvenient Indian” that “You can find Dead Indians everywhere.” He’s referring to things like the sports teams Chicago Blackhawks and Atlanta Braves, the western movies you watched as a child or the pursuit games you played outside with your friends. I don’t think King stumbled upon this idea as he was excavating his new home on Water Street in Guelph, but the find definitely made him chuckle. An ironic, iron Indian. It’s the sort of humour that flavours all of King’s writing, and makes his sometimes grim tales nonetheless highly entertaining reads. But construction wasn’t the only challenge the couple was facing in 2007, just as they were finishing their house. King was also asked to run for the federal NDP nomination in Guelph that year, after Liberal MP Brenda Chamberlain resigned mid-term. He accepted and party leader Jack Layton attended King’s nomination meeting and later campaigned with him in the ensuing 2008 byelection. And there was another personal issue at play in their lives, as they were about to become grandparents. Their daughter was due to give birth in the fall of 2008 but the baby boy arrived in July, so King and Hoy were visiting their grandchild in the hospital in the midst of the campaign. Set for Sept. 8, the byelection was abruptly cancelled when Prime Minister Stephen Harper called a general election for Oct. 14, and the Guelph campaign was extended for a further five weeks. Liberal Frank Valeriote won the election and Hoy and King turned their attention to being active grandparents. It sounds like a 12-month maelstrom in their household: construction, illness, election campaigning, a baby — but eventually things settled down and they moved into their new home. They give me a tour of their place, pointing out various esthetic and environmental features. The main floor of the house divides neatly between the large communal space that is their kitchen, dining room and living room and the smaller outlying rooms that serve as offices, bedroom and “engine room,” as King calls it, where the small boiler and various utilities are located. Although they have beautiful stained-glass pieces, there isn’t a lot of artwork in the house. But there are books everywhere, not in a single location, but in various bookcases. The other feature is family photos, including a fascinating one of Hoy’s large family, which shows 11 siblings, including four sets of twins, all born within seven and a half years in Sudbury. Hoy has a twin brother. We go upstairs, which is a half-storey with gently sloping ceilings. It includes a guest bedroom and bathroom and a north-facing studio that gazes down onto Royal City Park and the river across the street. It was designed as Hoy’s painting studio. She did paint in the upstairs room for a while but they eventually found the single home could not accommodate their respective creative methodologies. Hoy likes to play music when she paints, and even to dance if the spirit moves her. King, whose office was directly below, likes a cavelike workspace, with total quiet. And there was a subtle, artistic competition between them. King’s creative power is overwhelming, Hoy says. “He is so dedicated and talented and unafraid,” she says. When he mused about trying his hand at painting, she forbade him, “because he would have it well underway in a year,” which would stifle her. He smiles as she says this. His non-fiction book is filled with tributes to Hoy, and he clearly respects her opinions and seeks her advice when he’s working. But she needs solitude, away from King, if she’s to establish a new artistic career, post-retirement. King, 72, retired in 2011 and Hoy, 66, in 2012. They both refer to each other as their “partner.” Are they married, I ask? They smile at each other, and he asks her to tell the story. However, at a crucial early point in their careers, they were offered a spousal hire at the University of Minnesota, and they had to wed.
“So we were married on April Fool’s Day, by a justice of the peace!” concludes King, with a sly smirk. 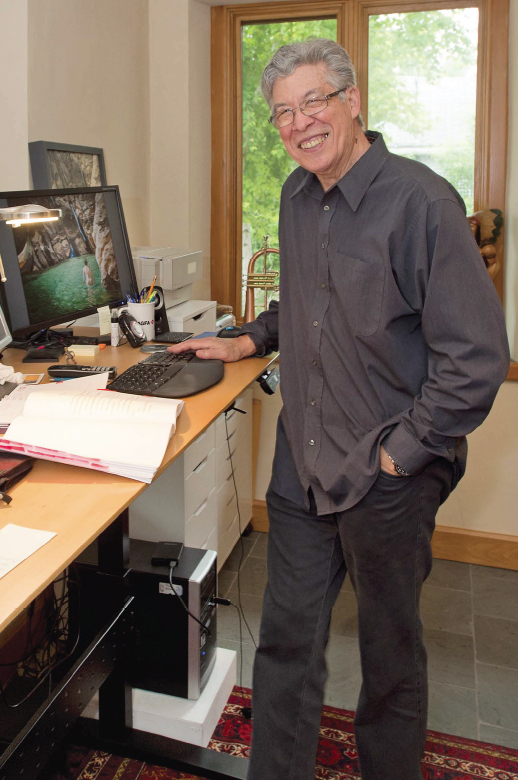 Here’s the truce they’ve come to as far as art is concerned: King can write his award-winning books in the downstairs office. Hoy reads his early drafts, and encourages him in the things he finds hard to do — she insisted he keep at the novel that eventually became “The Back of the Turtle.” But he can’t do anything in the art realm, except photography. Hoy leaves every morning to go to a second-floor studio loft in an old building off Douglas Street in downtown Guelph. There, she can play music and paint in solitude. I visit her one sunny day, curious to see how she’s adapting to her new medium. Her output is immediately impressive. She paints large landscapes in oils and has finished works lined up around the room. She credits the new workspace, which she’s been in since last February, with giving her the freedom to create large work, and to think in terms of series. 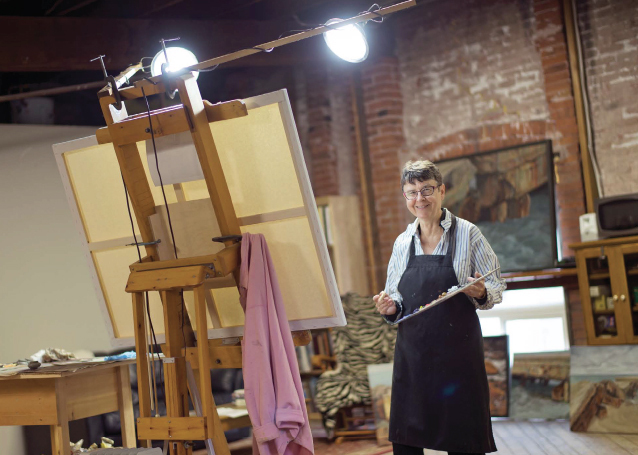 Helen Hoy paints oils in her downtown, loft studio. Her easel sits prominently at one end of the large room, which features wooden beams and brick walls. The space is lit by a small window and a pair of large artificial lights. She’s painting a Georgian Bay water scene, and her subject matter is drawn from a photograph she’s taken, which is tacked above the canvas. I look around the room and notice the print of a naked woman, her back to the viewer, walking into a pool of green water. It’s the painting from “The Back of the Turtle.” But I also notice other paintings in the studio corner, which are more literally of sea turtles. Is she the subject on the book cover? I ask. “Yes,” she replies. It’s from a photo that King took when they were travelling in New Zealand. Although she tried to illustrate the cover more literally with the turtle paintings, King liked the one of her bathing better, and the publisher agreed. It alludes visually to the opening scene in the novel, where the main character, Gabriel, attempts to drown himself in the ocean. None of the details are right — the swimmer on the cover is a woman, not a man, and the water is a gentle pool, not a threatening ocean shoreline — but it was an attractive composition, one that would help market the book. And so it stuck. Hoy seems totally immersed in painting now, after a career of teaching and literary criticism. She has rows of art books on a nearby shelf, which she studies at lunch. She took art training, but now she’s making a discipline of it. She worries a tiny bit that perhaps “there are other pleasures of retirement that I’m missing out on,” but clearly it’s the study of light, shadow, form and colour that has captured her imagination and to which she devotes all her time and energy. In writing, she says, the process is slow and incremental, but in painting, she finds, “suddenly it pops,” the work comes to life in front of her eyes, a revelation she clearly relishes. Did she ever try to write fiction, rather than analyze it? And, of course, there’s the King factor. It’s difficult to write when there’s a celebrated Canadian novelist hard at work just down the hall. This story first appeared in the inaugural issue of Guelph Life magazine, September 2015. For the magazine version with these and other photos by Dean Palmer, see here.